Due to technical difficulties, a house deep clean and the in laws arriving, I had literally five minutes to throw this post together. Luckily I didn’t finish in time and I now have a little bit of evening to devote to edit this, which is super lucky as on reflection I made no sense what so ever! However I don’t know if I ever make much sense, but hopefully that is just part of my charm. This post is v. short, we have our cousins, nieces and nephews staying and I have lots of feeding to do, ah happy days! And I have a week of perfecting my pronunciation of ‘Nie rozumiem’ and deciphering hand gestures and body language. Having spent much of my spare time in the last few days cooking and getting ready for visitors, I have not had time to develop new recipes. But I stumbled upon this recipe while away in January and have been making it ever since. D and I had been out roaming around the mountains of Lanzarote and were totally starved. We pulled into the only little place that was open during siesta hours and had a very yummy bowl of lentil soup. D asked why I didn’t make this type of soup and in truth the only reason I didn’t make something like this in the last few years is because I believed he didn’t like lentils. Much to my surprise he loves them! On getting home from our drive, my mother (who we were staying with) was feeling pretty rotten and the next day I made this soup for lunch. She and D have since asked for this soup and so I made it (it and many salads, lasagnes and cakes) so the in laws can snack on it when home from exploring Ireland. It’s hearty and warming and perfect for the chilled spring evenings. 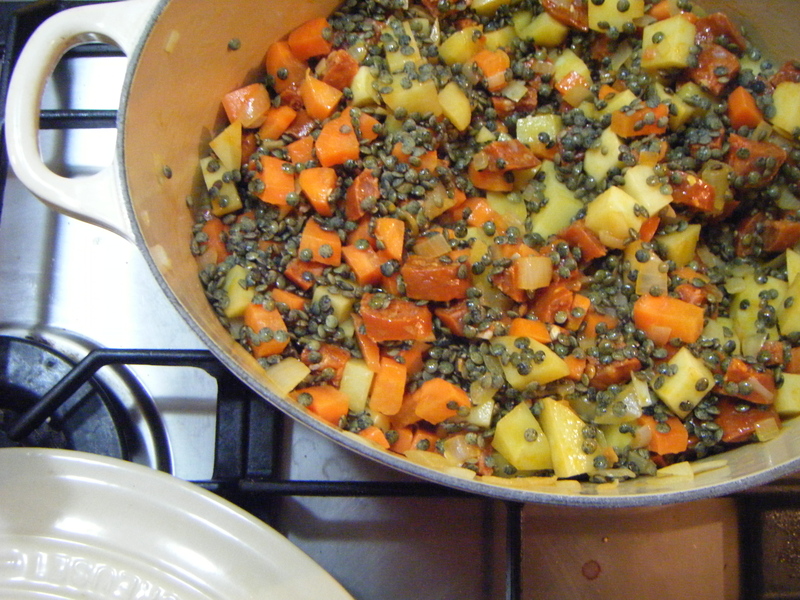 Heat the oil and butter in a large saucepan or casserole dish saucepan or casserole dish. Gently fry the onion over medium heat for about 5 minutes. 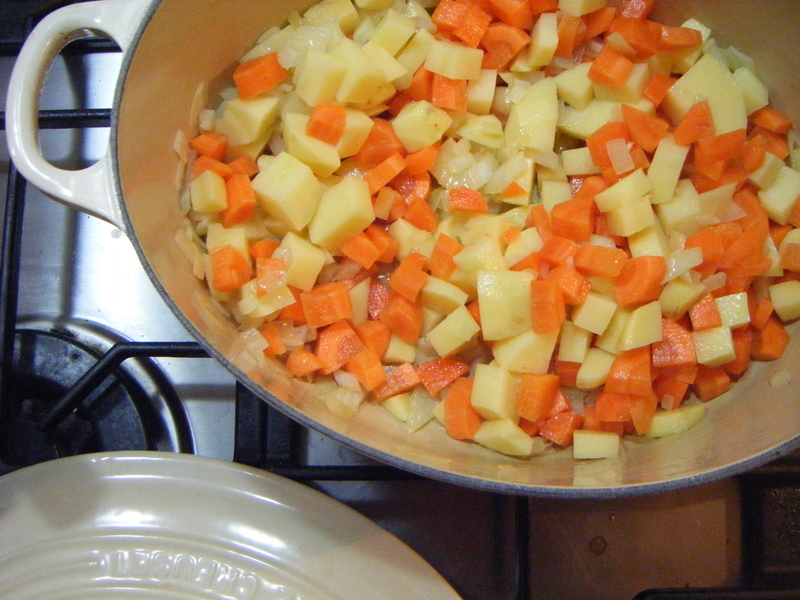 Add the potato, carrot and garlic and cook for another 5 minutes. 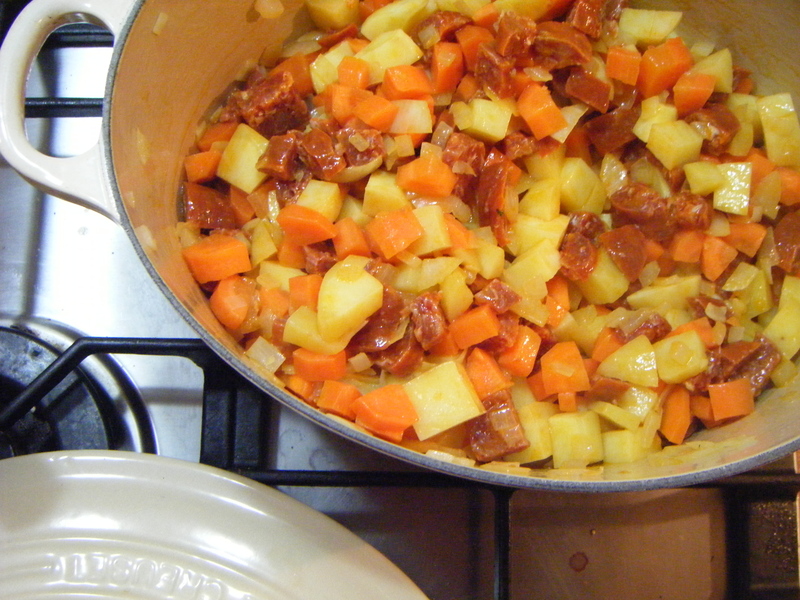 Add the chorizo, stir and cook for a few minutes until the oils from the chorizo start to break down and coat the mix with a lovely yellow hue. Add the lentils, stir, season and add the stock . Bring to the boil and add the mushrooms, then cover and leave to simmer on a low heat for about an hour. 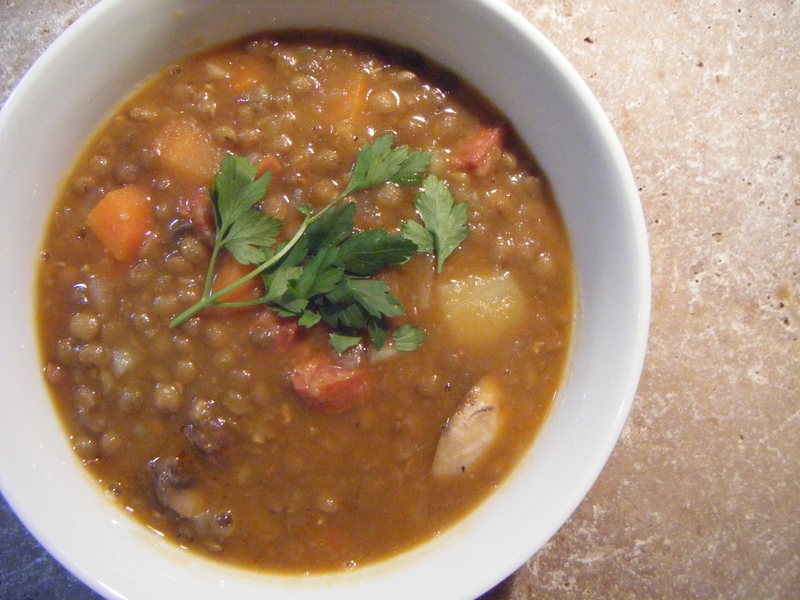 The longer you leave this to simmer the better, as the lentils and vegetables start to break down and it becomes and chunky creamy like soup. If it is a little thick for your liking add more stock. Serve with warm crusty bread.